Leonard will be 80 on September 21. It’s time to discuss how the fan community could commemorate this very special day. 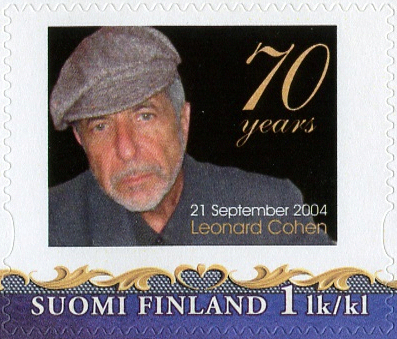 320 members donated to the stamp project, and their names were listed on a Birthday Certificate given to Leonard on his birthday. Also a special birthday postcard with the stamp, postmarked on September 21, was mailed to all of them. 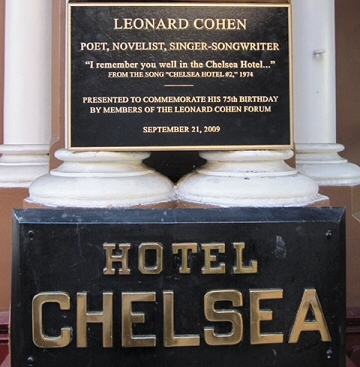 Thanks to our successful campaign, Leonard joined Dylan Thomas, Brendan Behan, Thomas Wolfe and other luminaries with the plaque dedicated to him at the entrance to the Chelsea Hotel, 23rd Street, New York City. Now we need new ideas – YOUR ideas - for the next big Birthday! In our view a traditional gift would not be the best way; Leonard got thousands of gifts during his tours 2008-2013! We need something unique! Looking forward to your suggestions!! Whatever we decide, I'm in! the first thoughts that came to my mind would be, if any of us knows a well known artist, is to ask him/her to paint a painting inspired by one of LC's songs, or we could maybe ask Dominique Issermann if she could help? It would be good to have something that will be remembered in the collective consciousness - Leonard included - for long after September 21, 2014. I would like to see a 80th birthday celebration with a celebratory (tribute) concert in an iconic venue long associated with Leonard. Naturally I thought of the Royal Albert Hall in London (I believe the proms season ends on September 13) but I dare say there are other possibilities. We could surely bring this off - we have friends in high places (RobH are you there? ), musical connections all over the globe at all sorts of level and tickets would SELL so funding would not be an issue. Those who could not travel to the event would be able to see it on DVD and those of us who were there on the night would be able to relive it on DVD. Maybe just a crazy dream - or maybe someone else has already thought of it? What a great idea, Wendy. If it happens I'd certainly buy a ticket. But isn't the RAH usually booked up at least a year in advance? The RAH is busy on the night of the 21st Sept , but looks available on Sat 20th. Maybe not all crazy dreams are impossible ? Whatever else happens, someone needs to organise the nurse with a packet of cigarettes! Mabeanie1 wrote: It would be good to have something that will be remembered in the collective consciousness - Leonard included - for long after September 21, 2014. I would like to see a 80th birthday celebration with a celebratory (tribute) concert in an iconic venue long associated with Leonard. Naturally I thought of the Royal Albert Hall in London (I believe the proms season ends on September 13) but I dare say there are other possibilities. We could surely bring this off - we have friends in high places (RobH are you there? ), musical connections all over the globe at all sorts of level and tickets would SELL so funding would not be an issue. Those who could not travel to the event would be able to see it on DVD and those of us who were there on the night would be able to relive it on DVD. It would be very, very hard to pull this off - not least because it's too late now for a September concert. If you want to have A- (or even B-) list talent, you'd have to get to work on scheduling, the contracts and rights issues immediately. I'm not even talking about the money this would cost (even if you'd do it for a charitable cause, you'd need to pay for the venue, security, organizational staff, sound & light crew, equipment, rehearsal space and dates etc), and you'd need someone who could get the performers together that late in the game (most everybody is usually booked a year or more in advance). MattW - I wasn't altogether serious in the sense that I am well aware of the difficulties and work involved in that sort of venture and I suspect artist availability would be a major problem even with another year to organise, quite apart from anything else. Meanwhile, there is always someone around to pour scorn on your crazy dream. Mabeanie1 wrote: Meanwhile, there is always someone around to pour scorn on your crazy dream. It was not my intention to "pour scorn on your crazy dream" and I apologize if my posting came across that way. An event in Montreal would be fitting, although attendance by European admirers would obviously be limited. 2017 NOVEMBER 4-8 - MONTREAL "TOWER OF SONG" CELEBRATION - RIP, YOU GOT ME SINGING! 1) a grove of trees planted in Israel in honour of Leonard's 80th birthday. Everyone who wants to, contributes by buying a tree or more. (Some of us did this as a memorial for Arlene). Trees are planted to honour people for many occasions as well as in memory of someone. They provide you with a certificate with all the names of people who contributed to the planting. I like the idea of a tribute concert but at the same time there have been many tribute concerts and it would be nice to do something different. If the tree idea doesn't resonate hopefully someone will come up with a unique idea that is easy to make happen in time for his actual birthday. 2) Another idea is if someone would be able to create a CD or DVD of individual people saying one line of birthday greetings. Maybe one of the more 'techie' advanced members would have a better idea on this line. Great thread Jarkko & Marie and thanks for giving us lots of time to plan and come up with something special. Last edited by mutti on Tue Apr 15, 2014 2:30 am, edited 1 time in total. Agree this is a timely and helpful thread. Am confident this creative group can come up with a meaningful gesture of appreciation and recognition. I dont know if it still is, but greece has played andere important role in Leonard's life, music and poetry. Maybe an interesting line of thinking? As far as anyone else, I'm thinking about what I personally would like and be able to participate in. Perhaps, I'm not alone and together we'll do something interesting and pleasant. I always wanted to ask Jarkko what The Leonard Cohen Video Contest was like. It sounds good enough - and even better and more suitable if we replace "contest" with "festival". Not a competition, but a celebration. If one search through YouTube, it will become clear that many people around the world are making LC-related videos. Mostly covers (and sometimes it's not Hallelujah! ), but also amateur clips and even tribute songs. After all, Leonard Cohen is a star and we know that. So - could we stimulate, direct this activity by holding such a virtual festival? c) nice material for Cohenites' gatherings: 1. let's film something! 2. now let's make our nearby bar a venue for an international fan video festival!